Veronica and Luis (“Lucho”) were both born and raised in Colombia. Lucho Forero is an electrical engineer with an M.B.A. and a degree in Marketing. In 2000, he accepted a job in telecommunications. The firm was based in the D.C. area, but his job was in an office in Miami. Meanwhile, Veronica was in Colombia earning a degree in clinical psychology. On business trips to Colombia in 2003, through a common friend, Lucho and Veronica first met. Lucho began spending more and more time in Colombia, falling in love with this beautiful and strong woman who was also a woman of deep faith. It wasn’t long before the two were married, and in spite of the sorrow they felt in moving away from their families, they decided to settle in Miami where Lucho worked. They found a strong community of like-minded families in Key Biscayne. As the years passed by, their family began to grow. First Micaela arrived, followed by Candelaria, and then a year later, Lucia. Three beautiful little girls, with lush brown hair and bright brown eyes that shine with joy and innocence. By 2011, the Foreros had made many friends in Key Biscayne, and their lives were filled with parties and playdates. But Micaela was now four, approaching five, and her parents began to think seriously about school options for her. Along the way, they had become interested in a parenting philosophy called “Attachment Parenting”—essentially, allowing the child to be as close to the parents as often as they wanted. It’s a “pure formula of finding the love,” Lucho explains, in any situation. Along those lines, Veronica were open to homeschooling Micaela, but they didn’t have a strong homeschooling community around them. They also felt drawn towards a school in the classical liberal arts tradition, but once again, nothing in their area fell into that category. So they did some research. Lucho was enthusiastic to find out about a network of classical schools around the country run by Dominican Sisters. As he continued to learn about these schools, he found that there was one such school operating just across the state of Florida, in a little town called Ave Maria. Excited by this discovery, the family took a trip across Alligator Alley to visit Donahue Academy. After meeting with then-headmaster, Dr. Daniel Guernsey, the Foreros toured the community and fell in love with what they saw. “We saw much more than a Catholic school,” Veronica explains. “It was just what we were looking for.” “We started having a lot of social commitments in Key Biscayne,” Lucho adds, “and those things were not relaxing. It became a little stressful. We wanted to focus most of our attention on our kids.” Agreeing, Veronica sums up: “We wanted a simple life; that’s all we wanted.” By this time, Lucho had become self-employed. The couple quickly made arrangements to relocate to Ave Maria, and by the end of the following month, they were settled in a home in Hampton Village. Over the summer, a technical detail cropped up that meant Micaela wouldn’t be able to enroll at Donahue in the Fall. The Foreros had moved to Ave Maria for this opportunity! Always putting their trust in God, Veronica and Lucho waited to see what would come of their family’s adventure, and sure enough, it wasn’t long before another way became clear. Veronica was walking past Ave Maria’s Montessori School, which is located just off the Piazza, when her interest was piqued. She had made new friends in town who sent their own children to the Montessori school and who spoke highly of the program. She also discovered that, through Florida’s VPK program, Micaela could attend for free. That Fall, as the children of Ave Maria headed back to school, Micaela herself shouldered a backpack and set off to Casa dei Bambini (later, Ave Maria Montessori). In November, the Foreros welcomed their fourth little girl, Sarah, into the world. They were adjusting well to their life in Ave Maria, loving the freedom that comes from living in a small community—the freedom to focus on their family life and to be truly present to their children throughout the day. Veronica and Lucho were happy with their decision to send Micaela to Casa dei Bambini. As they learned more about the philosophy that governs the Montessori education, they were increasingly drawn to adopt it in their own lives, at home with their family. Veronica mentions that she already implicitly had been living some of the Montessori practices in the home. “I was doing Montessori without knowing it…I always wanted to welcome the children into the work of the family; it was the way we lived faith in our house—being with them, praying with them, joining together in everything.” Now, wanting to learn as much about the “Montessori Way” as they could, Veronica and Lucho began listening to a series of talks by a “Maggie.” Through these talks, they learned about the methodologies and practices that set a Montessori education apart—things like the banishment of punishments and rewards, which set out motivations that are external to the action at hand. “We have proof with our children that the only motivation that you need to do anything in life,” Lucho explains, “is the satisfaction of doing that thing well.” Veronica jumps in to clarify that there are still natural consequences in place. If a child abuses something, then it’s taken away until they know how to use it properly, she explains. But the idea is that the child learns to do things for the joy of having a task accomplished, or of setting things in order. Another aspect of the Montessori method is a respect for the pace of every child, without consideration of age. In Montessori classrooms, children are grouped in wide age ranges. (The Children’s House spans 3-6 years, while Elementary goes from 6-12.) “All children have to go through their own motivations, their own approach, and their own process,” Lucho says. Veronica remarks that from this attitude, a culture of collaboration—not competition—is born in the classroom. Older children help younger children, and younger children help older children accomplish a task. “And it happens naturally!” Lucho exclaims. The third Montessori practice that the couple mentions they have really taken to heart and seen the good of it in their own lives is the practice of not assigning homework. “The homework of a kid in his house” Lucho says, “is to be a good brother, a good son, and to help with the things that are happening at home.” When the children come home from school, they are free to participate fully in life at home—helping with laundry, cooking, preparing and serving the evening meal, tidying up, praying together, and getting ready for bed. This approach to home-work, though, only works if the family is fully onboard. And onboard is exactly what the Foreros were striving to be. They soon began ordering their home life to mirror the environment of the classroom as best they could, letting the work of the home take place at the pace of their individual children. Veronica and Lucho laugh about how, at the beginning, dinner and bedtime would take three hours every night, and everything would be a mess. The children were setting the table, serving their food, clearing the dishes afterwards, getting themselves dressed for bed, and even brushing their own teeth. Glasses would break, food would fall to the floor, pulling on a nightgown would take forty-five minutes of struggle. “But it was all about the dignity of the child,” Lucho shares, “and the development of their will—allowing them to develop their will.” He continues, explaining: “We knew that giving the kids the dignity of always doing the best they could on their own in a prepared environment was going to be the key to having balanced kids with not just strong wills, but also with the will to do always good. We would give the kids the possibility of doing on their own whatever they could.” They saw in their lives that when they came in and took over what the children were doing, although much faster, more efficient, and cleaner, they were essentially asking their children to delay the development of their wills. Veronica comes in with her own reflections on how all of this seemingly earthly chaos was aimed towards a greater spiritual good. “The beauty of this is that it is not about independence for independence’s sake. God has put this inside of them, to learn to be independent, so that then they can be good servants to others. They will have the skills that are needed in order to serve the other. At the beginning they are building themselves, but as they build, they start to have the desire to help others.” Later on, she says that they chose to focus their attention on developing a community of love in their home, as parents with their children. “We are the first face of God in their lives,” she says. You see, along this journey, the Foreros had discovered that there was a spiritual dimension to the Montessori education. In fact, the founder of this philosophy of education, Maria Montessori (1870-1952), was herself an Italian Catholic. She had developed an entire program that focused on the spiritual development of the child, the “Catechesis of the Good Shepherd,” which takes place in a specially prepared classroom environment called “The Atrium.” As soon as Veronica learned about the Atrium, she felt it was the missing link in their lives. “I only thought how sad it is that we have the Montessori here,” Veronica shares, “but it was not Catholic, because we are a community of Catholics… I thought that was a shame.” She sought out training in the Catechesis of the Good Shepherd on her own, and built an Atrium in her home. “If someone has a room in this house,” Veronica recalls thinking, “then it should be God.” Veronica began inviting neighbors and friends to join them once a week in their Atrium for a lesson in the Catechesis of the Good Shepherd. “Through Maggie’s talks,” Lucho says, “we bought into the idea that the spiritual life of the child starts very early. When they are two or three year’s old, that’s the time to create a sensitivity, this ability and this discipline that ends up being your prayer life.” Around this time, they began searching for the elusive “Miss Maggie.” They had so many questions about the practicalities of integrating school life with home life, and about bringing it all together in the Atrium. They had also discovered, to their surprise and delight, that the Ave Maria Montessori school was interested—even eager—to open up an Atrium themselves. The founder of the school, Catie Raiger, had tried before, but every attempt thus far had failed. With a conviction of the importance of implementing a spiritual dimension to their children’s formation at school, the Foreros located “Maggie” at a Montessori school in Virginia. Pregnant with their fifth child (this time a boy, Francisco), and with little Sarah in tow, Veronica hopped on a plane to visit “Maggie’s” school and talk things through on how to set up an Atrium at Ave Maria’s school. At the end of her visit, she learned that “Maggie” was already considering moving down to the Naples area and might be able to help them start an Atrium. By the beginning of the next school year, “Maggie” was the new Director of Casa dei Bambini. In the Montessori education, the Atrium is truly at the heart; it is not an addendum. With “Maggie’s” direction, the school at Ave Maria was able to make it a central part of their program, and then started Ave Maria Montessori. “We couldn’t believe what was happening,” Veronica exclaims. “I was not expecting big things to happen, I just wanted a space for my children to be with God in their own way. But it was all God planning things, doing His own will in His own way.” Veronica still has an Atrium in her home, and it’s a space her children love to go to on their own, when they are on vacation. Now, Veronica works full-time in the Atrium at Ave Maria Montessori, and all of their children are there with her at the school. Lucho also teaches computer programing to this year’s pilot program of Secondary Education. As beautiful as they find the Montessori education, Veronica and Lucho are agreed that they are only open to it if they can be fully involved with what is going on in the school. “In my experience, we have been, since the beginning, totally involved. I, personally, would only do school if I am totally involved,” Veronica says. “The beauty of Montessori is that it tries to imitate the home environment in a classroom.” It is almost an extension of the home. 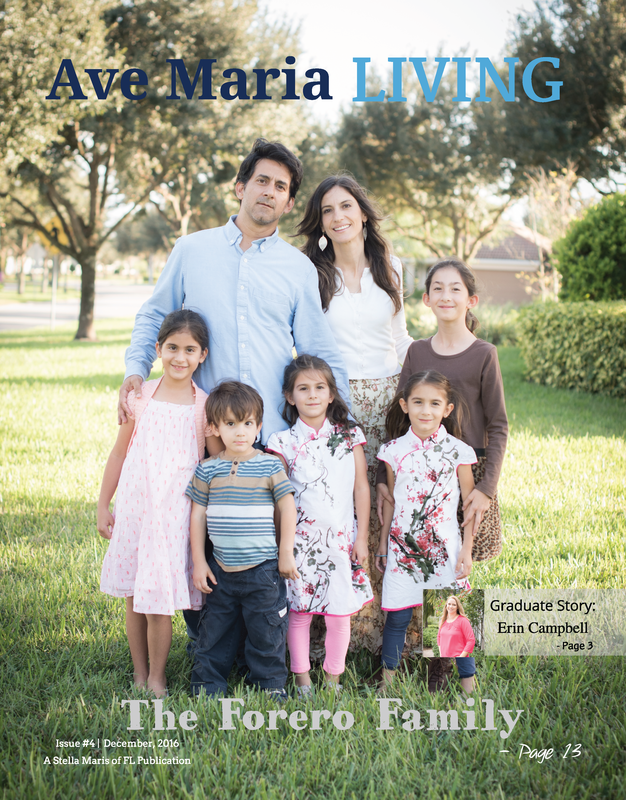 What the Foreros love about what they have found in Ave Maria Montessori is the fluidity, the open communication between home and school. This relationship is what allows them to do what they came here to do: focus on their children’s development and be fully engaged with them along the way. Towards the end of their interview, Veronica and Lucho are eager to clarify that it’s not about being perfect parents. “It’s a very great experience of learning to be humble and committing a lot of mistakes. But it’s so beautiful to be able to do this in union with our spiritual life, because we know that there is always a place for forgiveness. Sometimes we get frustrated, we have five little children… But it’s not about being perfect; it’s about having a relationship with them, and a relationship with God,” Veronica shares.